OVERVIEW: Twilight in Forks: The Saga of the Real Town arrives on single disc DVD on March 20, 2010 – the same day The Twilight Saga: New Moon will be released nationwide on DVD and Blu-Ray. Located four hours northwest of Seattle , Forks, WA is both a real town and the fictional home of The Twilight Saga’s beloved characters Bella Swan, Edward Cullen and their family and friends. This documentary brings fans of the books and movies to heart of the town that’s now experiencing new-found fame since it became central to the tales written by Stephenie Meyer. 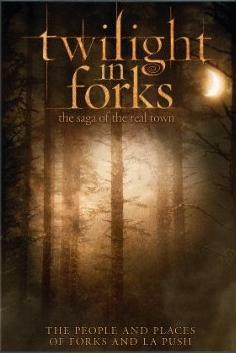 SYNOPSIS: The definitive DVD documenting the town of Forks made famous by the Twilight books and movies. This is a fan’s opportunity to see the town that Stephenie Meyer based her epic teen romance books on. Hear from the real people living their lives in the town fans know and love, including the Chief of Police, the Forks Outfitters’ employee who gets mistaken for Bella, and the vampire transplant who plays the real-life role of Alice . Visit Forks High School, hear self-described Jacob’s grandfather tell the legend of how the Quileutes descended from wolves, and see many more of the people and places that make Forks and La Push the perfect setting for The Twilight Saga.